Making the selection of the best cat brushes serves an important function for your cat’s health; they can help to prevent fur matting, shedding, as well as help maintain the fur health of your cat. While selecting a cat brush may appear self-explanatory, it is important to spend money on something that works and is functional. Before I get into some of the best cat brushes for your cat’s fur, it is important to discuss first some of the benefits that brushing your cat’s hair provides. The fur on your cat is not just something that is designed to grow and then just fall off for you to clean; instead, the fur on your cat functions to support the overall health of your cat’s scalp, similar to your skin. The fur protects your cat from all sorts of environmental and indoor things that can seriously harm your cat, so healthy fur is important. Cats generally known for shedding and one way to help stop shedding, or at least to moderate how much shedding occurs, is with regular brushing. Regular brushing collects the fur that has come out of your cat and it is a fast way to collect it all up. Cat hair matting or knotting is something that can cause your cat to feel uncomfortable. While you may think that a simple knot in your cat’s fur is nothing that causes harm, I can certainly develop to the point where you need to cut the knot from your cat’s fur. 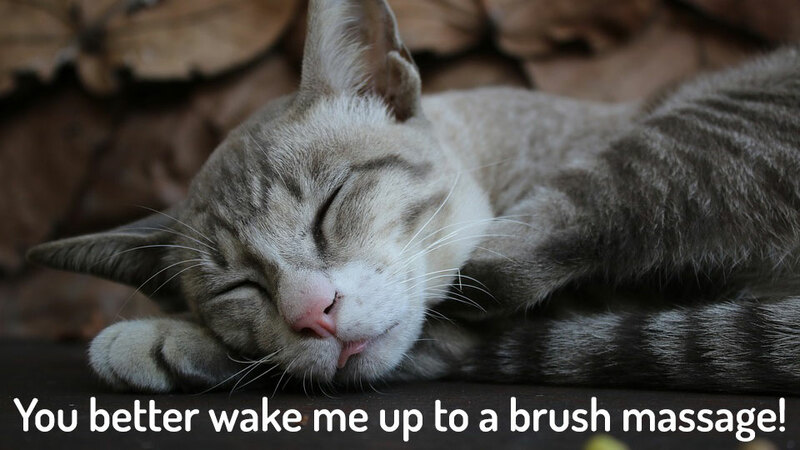 For this reason, regular brushing can help to straighten your cat’s fur and it can help keep your cat feeling comfortable. There is no doubt that brushing your cat’s fur is important for overall health, but one thing you need to consider is that not all cat brushes are equal in quality. Some of the best cat brushes are durable and appropriately engineered to help the experience with your cat. For this reason, listed below is an in-depth description of what you should look for when it comes time to purchase a cat brush. There are a number of factors to consider including the brush design, overall cost, reviews, and what others are saying about the brush in general. The following best brushes can all be found on Amazon. This is a pet brush that is designed to reduce shedding for both dogs and cats so if you have both pets then consider it for either (just be sure to clean it after each use). The design of the Pet Neat brush is basic. It contains a sturdy and small handle that is attached to a 100 mm shedding tool at the end. While this not a standard brush, the shedding brush is a highly popular form of brush that is used more than the typical style brush. It is only about four inches long, made of stainless steel (the brush part that is), and it comes with a cover so that can maintain its quality between uses. Similar with most pet brushes, this one is not going to break your wallet. It costs about $15 on Amazon, which is a great deal when you consider how much it costs to send your cat to the local groomers for a spa day. This pet brush has been purchased by quite a few customers and 1200 customers have left reviews. Of these reviews, 87 percent of the customers felt this was a 5 star product, with another seven percent leaving a 4 star review. Overall this cat brush only has a two percent negative review rating, thus making this one of the best cat brushes you can find. What are Customers Saying about the Brush? Some descriptions of the brush can be found on some of the reviews, but customers have stated that this brush is “amazing,” “fantastic,” and that it works like magic. Overall, customers appear quite satisfied with the quality and functionality of this cat brush. This is another shedding type of cat brush that can also be great with dogs. It has great reviews, is reasonably priced, and simply outperforms other cat brushes that are currently on the market. This brush design is similar to the cat brush mentioned above, but there are slight differences to be aware of. It is only about four inches in size, which is the same as the previously mentioned brush. The handle is described as being sturdy and will not break in mid brushing, which is a great feature with some thicker haired cats. The Chirpy Pets cat brush only costs about $15, which is right around where most other cat brushes cost as well. Perhaps the most important aspect of this brush is that is contains some of the best reviews around. More than 3400 customers have reviewed this brush and 89 percent have given this brush a 5 star review. In addition, seven percent gave this a 4 star review and only one percent gave it a one star. This is one of the best cat brushes found on Amazon and it has some of the highest ratings as well. Some customers have stated that this brush works well, which is exactly what you want from your cat brush. In addition to it working on your cat’s shedding, customers suggest that this cat brush is easy to clean, easy to use, is durable, and it does not contain any significant issues. The Furminator is one of the best brands of cat shedding brushes around and this brush is particularly similar to that of the Chirpy Pets and Pet Neat brushes. Let’s look into how the Furminator separates its brand from the others. The design of the Furminator is quite similar to the previous brushes, but the difference is in the handle. The Furminator handle is ergonomically friendly and it contains small gel cushions for support and comfort. There is a trigger release to help the fur to separate from the brush, which is handy to prevent the hair from getting all over your hands. The interesting thing here is that the Furminator is typically considered to be one of the best cat brushes and one of the most expensive, but the good thing is this cat brush only costs about $11 on Amazon, making this a cheaper and effective option for any cat owner looking to maintain grooming. It should not be too surprised when I mention to you that the Furminator has great reviews because it does. First of all, the Furminator for cats is one of the most reviewed cat brush de-shedding tools on Amazon and currently there are close to 5900 customer reviews. Of these 5900 reviews, 82 percent have given this brush a 5 star rating, in addition to another 11 percent giving it a 4 star rating. Overall, the Furminator has a 4.7 star rating and general approval of at least 93 percent of customers. Many customers have mentioned that this is the best brush they have ever had. Also, pretty much every written review suggests that this brush has worked as described and then some! This is a different type of brush from the others and just by looking at the cat brush you can see the difference. The biggest difference in this brush compared to the others listed thus far is in the brush head. The cat brush is made up of fine bristles, which are described as stainless steel pins. These pins serve as a soft massage for your cat as you brush them, so consider this a great perk for your cat. The self-cleaning design is something that customers rave about with this brush, as one push of a button and the pins sink into the brush and detach the hair. The Safari Cat brush is a great deal when it comes to other cat brushes. It is made of quality material, but yet this brush only costs about $7 on Amazon. This is a great perk that many cat owners enjoy and saving a little money never hurt as well. Similar to the other cat brushes, this one is highly rated on Amazon. There are more than 1140 customer reviews left on Amazon and 80 percent gave this cat brush a 5 star rating. Also, 10 percent gave it a 4 star review, with a grand total of 90 percent giving this brush a good and solid rating. I personally like the stainless steel pins of this brush and it is more of a brush than a de-shedding tool. For this reason, I consider this brush a steal and one of the best cat brushes that money can buy. Customers love the self-cleaning button of ridding fur from the brush without having to touch it. As far as hair collection, it appears this brush meets the needs of the customers and some have suggested that it has changed their life when it comes to grooming and cleaning up after their cat. The last cat brush on the list of the best cat brushes is a bit different from the others and I like how it is different. The Celemoon brush is made up of little massage, silicone material that is designed to give your cat a gentle massage as you brush them. The handle is perhaps the most ergonomically friendly out of the entire list of best cat brushes, as the brush base rests in the palm of your hand. The handle contains loops to prevent slipping, thus reducing any strain to the hands. This is another cat brush that is friendly on your wallet, as it only costs about $10 on Amazon. The Celemoon cat brush is another highly rated cat brush that you should consider for your cat. There are 300 customer reviews listed on Amazon and 72 percent have given this brush a 5 star review. In total, 84 percent have given this brush at least 4 stars, thus making this one of the best cat brushes around. The overwhelming reviews suggest that this cat brush is great and cats love it. The design in itself is important for your cat’s comfort and it is designed to be as comfortable for you as possible, so that you continue to use it often. Purchasing any of the listed best cat brushes is something that you should take seriously. If you are looking for a brush that prevents shedding and helps to boost hair health then consider any of the shedding brushes. Also, if you are looking simply to brush your cat’s fur for the sake of protecting it then consider the stainless steel pin brushes. Regardless of your choice, any of the cat brushes listed above should meet yours and your cat’s needs. Consider checking out my recent posts about cat beds here or cat litter here for more cat comfort care.